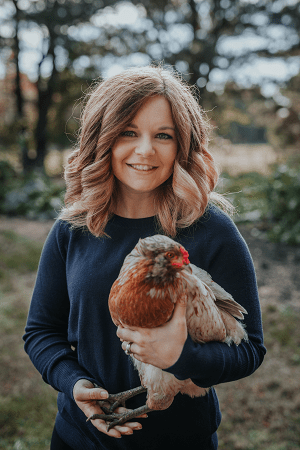 Question and Answer All About my Homestead, Minimalism, and More! I gave y’all the opportunity to ask me anything you wanted and received questions from all over the board! Y’all asked about minimalism, my farm, gardening, and daily routines! I also want to share a few additional things about myself just for the fun of it! If you have any additional questions, please feel free to leave them in the comments! I would love to answer them for you! The way I set up this post is the person who asked the question[s] are before the actual question and answer. I would love for you to check out their blogs, as well! Q: Do you ever have moments where you toss your minimalism aside for a bit and how do you get back on track? A: Great question, Marette! I have not tossed it aside in terms of adding clutter back into my life, but sometimes I do get a little spending happy. I some times buy things on a whim, whether it is a book, groceries, or something completely unnecessary. I am extremely passionate about living a minimalist lifestyle, so it is easy for me to stay on track with being tidy, consuming less, and finding a purpose. If I find I am struggling with taking the next step, I take a step back and allow reality to set in with how far I have come. So far, that has helped me get to where I want to be in my journey. If I was not as passionate, I would have tossed my minimalist lifestyle a long time ago. Q: Hi Erin! I would love to know about your morning / night routine! A: Hi Allison! My morning and night routine can vary depending on what day of the week it is, so I will give you my best case scenario! Make my toast and spread each piece with peanut butter. Gather my purse, lunch, coffee, and waters. Start the dishwasher. Then out the door I go! Cleaning the kitchen is a must! This means dishes in the dishwasher and clean kitchen counter tops! Wash my face and brush my teeth. If I am not completely ready to fall asleep, I will turn on Netflix and watch an episode of something with my husband. I hope this was what you were looking for in a response, Allison. If you would like me to go into more details about what I wash my face with or how I apply my makeup or anything like that, let me know in the comments. Q: Do you do tons of decorating for the different holidays, 4th July, Halloween, Christmas or fall, spring decorating? Large tree, small how does this fit into your lifestyle of minimalist. A: Love this question, Candy! I used to decorate for Fall, Christmas, Winter, Valentines Day, Spring, and Summer. However, after learning that some of my anxiety was sensory induced, I cut back on the decorations. Also, downsizing has started playing a big role in how much or little I decorate. Now that we have downsized, I plan to put up a few decorations for Fall, Christmas, and Winter. The rest of the time I will have a few pieces that work year round. I don’t have room for my 8′ Christmas Tree, but once we build our house, I will use it again. When it comes to combining my minimalist lifestyle and decorations, the two factors have been sensory and my love for the decoration. If a piece makes me feel overwhelmed, I let it go to someone else. If I don’t love a piece, I let it go as well. By including these two factors into my decision making, I have been able to let go of about 75% of my decor. However, I still have two large tubs of Christmas decor, one medium tub of Fall decor, and one medium tub for the remaining decor. My husband and I won’t live in 600 square feet forever, so I am allowing myself to keep the pieces I love for the future. I plan to go through all of the decorations about every 6 months to reevaluate if I want to keep it or not, so I am only storing what I absolutely am not willing to part with yet. Q: I’m always fascinated by other bloggers routine. How do you develop a post? A: I find inspiration from bloggers and YouTubers that I follow. Once I think of something I want to write about, I think of how my readers will benefit. Then I start writing. I usually rewrite a post two to three times before I am satisfied with it. From there, I tweak my post for the SEO keyword[s], create my title, then create and insert photos for the post. Q: Do you have raised garden beds or the traditional garden? Now that we’re getting more settled into our permanent home, I’m wanting to do a garden, but I’ve yet to decide which kind to do. We have a lot of deer in our woods too, so I’ll definitely have to fence it. Any gardening tips or thoughts? A: Great questions, Cara! We have a traditional garden, but with a twist. It has been raining a lot more than usual where I live, so we created higher rows to allow the water to run off and not drown the plants. Here is a picture to show you what I am talking about. This is our potato rows when we first planted them. Typically the dirt would be flat when you plant them, but I was worried about them drowning, so we planted the potato at ground level and built a mound on top. We have done this for our carrots, beans, and peppers as well. I did not do this with our tomato plants, because I decided to mound each one individually instead. So far this as worked great for us. We were the only one of our friends to not have plants drown the first go around due to all the rain we have had. As far as a fence is concerned, we have an electric fence. I wanted a pretty Pinterest inspired fence, but we weren’t sure if the place we chose was going to work for years to come. 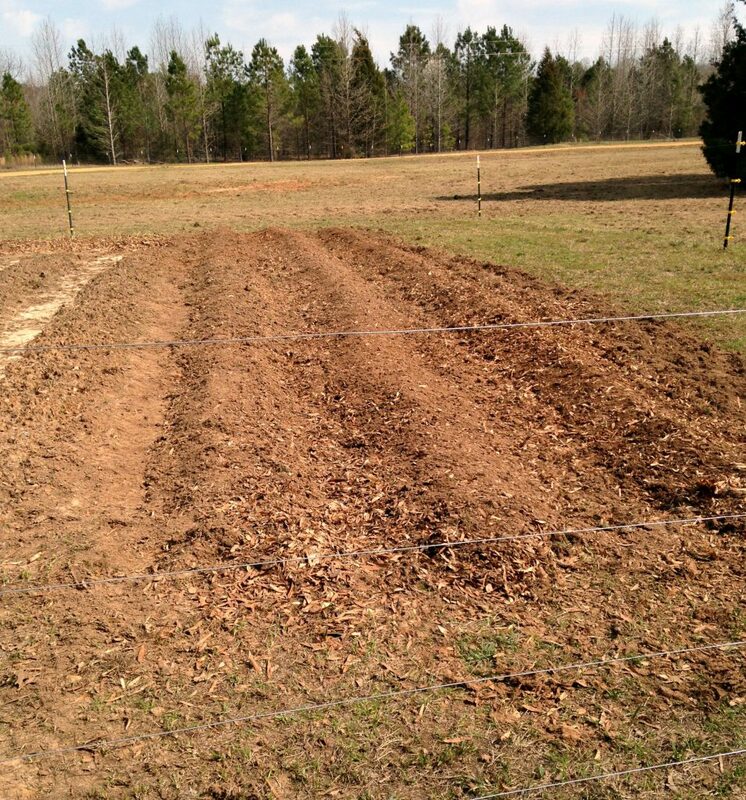 This is our first garden on our land, so we decided an electric fence was easier to move versus my pretty fence. Also, it is great for keeping our dogs and any pests out of the garden! Our dogs do not understand the concept of garden rows. They believe they can run straight through without damaging anything, and that is definitely not the case! haha! Also, grow what you love to eat. It is easy to get caught up in wanting to grow everything, but if you don’t eat it, it is kind of a wasted effort. A: Of course, Christine! But I am going to be honest, I am not ready to show off my house just yet. You see, my husband and I [mostly my husband] built our shop, and put up a temporary wall so that we could live in part of it and have a shop in the other part. Since we have done this ourselves, there are certain parts we have put off finishing until we have had the extra cash. We are getting close to being done with everything and I promise, as soon as we finish, I will give you the grand tour! First are my babies: Chevy [on left] and Harley [on right]! Chevy is 4 years old and a lover! She loves to give kisses and lick toes! Harley is almost 2 years old and a big ole baby! She loves to be pet and races to the gate in the mornings. This is when we brought our chicks home. This is them about a week or so ago! We purchased all of our chickens unsexed, which means we did not know what we purchased until they were about a month old. They were so much fun watching grow from babies to being big enough for The Coop! I loved seeing them transform, because I had no clue what they would look like when they grew all their feathers! Now they are crowing and roosting like big chickens! We have 5 Easter Egger chickens [All hens. I named them Falcon, Bambi, Bonnie, Clyde, and Pedro], 15 Rhode Island Reds [lots of hens and roosters… need to count], and 4 Buff Orpingtons [2 hens and 2 roosters]. I am going to be honest, and tell you we only plan to keep 1 rooster [A buff named Handsome! He’s a sweetie! ]… the rest will soon be processed and put away in our freezer…. But we are keeping all of the hens to have fresh eggs, sell eggs, and possibly hatch some baby chicks next spring! 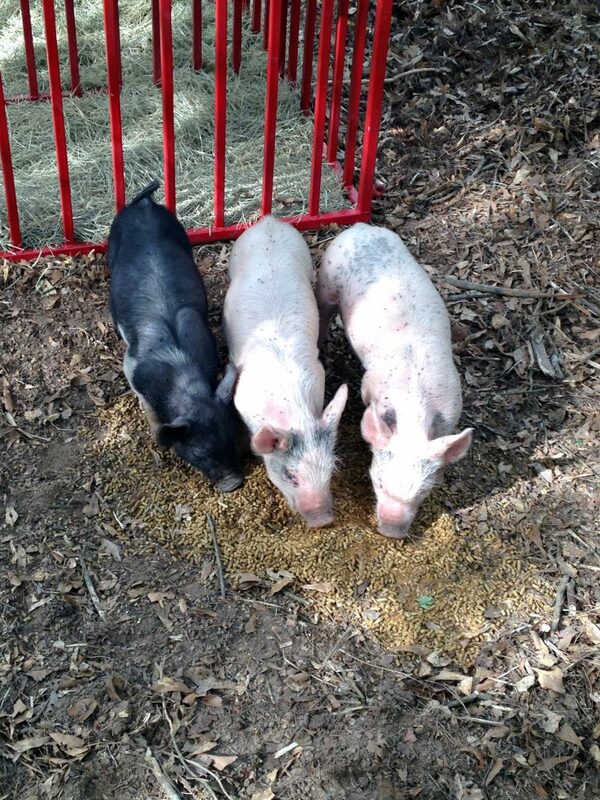 I’ve wanted pigs for a while now, and we finally have the space! They are the most curious animals I have ever come across! I knew my husband was the one the moment I saw him…. and I was 15! I have recently decided to join my friend’s Young Living Essential Oil team! My top travel destinations are Alaska and Ireland. Thank you all so much for your questions! I really enjoyed answering all of them! You all gave me inspiration for future posts, and I hoped you learned something about minimalism, farm life, gardening, and me! If you have any other questions, please leave them below in the comments! If I get enough questions, I may do this again! I’m sooo freaking out about the chickens! 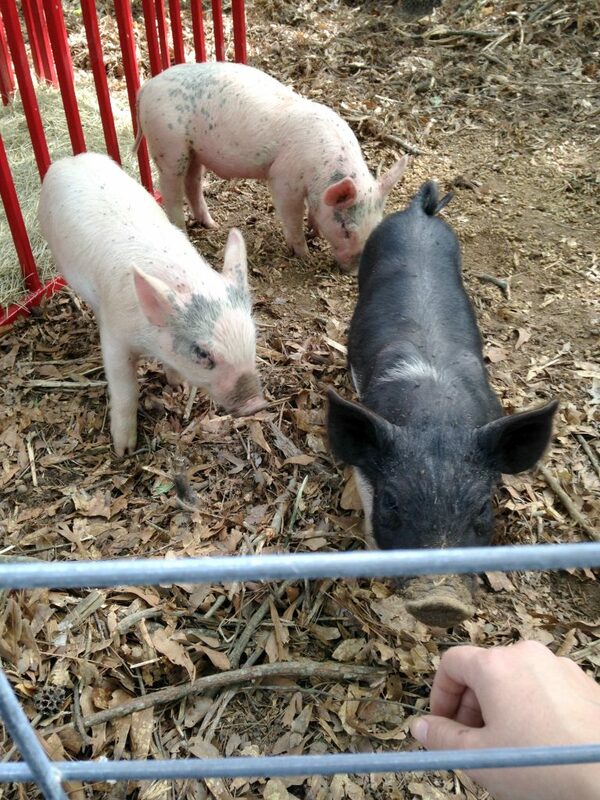 and the piggies! They are adorable aren’t they?! Yay! I love this! Thank you for sharing. Your dogs look like such sweeties! My inlaws are on their second batch of collie puppies and they are so much fun, you’ll just love it! You’re certainly welcome, Christine! My babies are so sweet! I will try sharing more of them on Instagram! I cannot wait for her to be a mommy! I really cannot wait to see how my husband will be with her, because he has never seen any of the process. The introduction of the sire was completely different than what he had imagined, so I know it will not only be an experience for Harley, but him as well! The hardest part will be rehoming all of the puppies. I am debating whether or not we will keep one, but only time will tell! This is such a great post! Everyone had such excellent questions and I loved reading the answers. Wow! You have a full day. I loved reading about it. Yes I do, Sherry! But I wouldn’t have it any other way!